A strange surreal offering from Darkfuse. 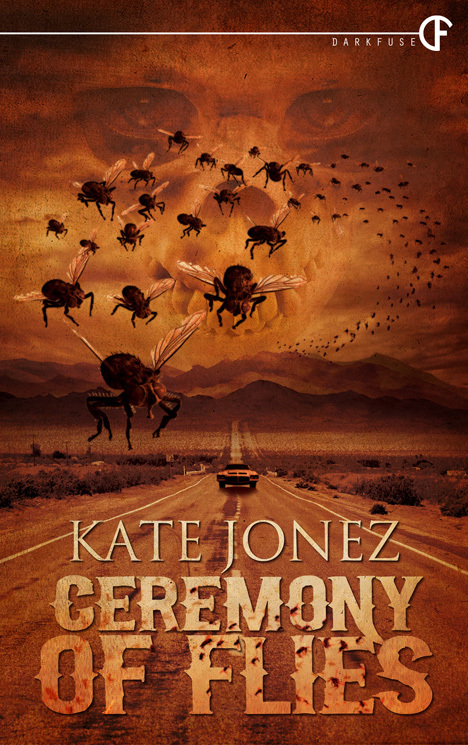 Reading Ceremony of Flies by Kate Jonez was a bit like tripping on acid. Not always sure where I was or how I got there but it was all good in the end. The story is told by Emily aka Kitty, a waitress from Vegas. Like a comedy of errors she has just killed her boss, is picked up by a bar patron whom she waited on, and is now heading out of town towards freedom. Rex the bar patron is on his way to Hollywood for an audition, when they stop for gas and a bite to eat Kitty makes the mistake of using a stolen credit card. It’s all down hill from there. Kitty shoots up the bar and they are on the run again. Why it is every time something is about to go down, Kitty sees the damn flies? Racing out of town they notice a little boy and his dog, full of remorse they stop and pick the odd duo up. Things begin to take on psychedelic hue. They stop at a mission where they meet a strange nun and Priest. Flies, a long time harbinger of evil are bigger here and more abundant. The Priest tries to take the boy Harvey from them in exchange for much needed car repairs. A fight ensues and the next thing that is heard is POP! POP! On the run once again, and out of options Kitty is ready to call it quits, when out of nowhere four motorcyclists appear on the horizon, riding in like the four horsemen of the Revelation. This is a deep tale told well. It’s about retribution and redemption, a new take on the age old good vs. evil. I don’t normally care for stories told in first person narration, but this worked really well and I don’t think it could have had the same impact if related any other way. Give it a read, I think you’ll enjoy it. The book is available right here.